“Wait a second – THAT isn’t a laser tag gun!” Astute observation, friend. So what do you do with this new product if you can’t shoot lasers out of it? Well, it’s time to turn your backyard into the single greatest movie theater of all time. With a 16-foot screen, a high-definition projector and Blu-Ray player, and two of our Portable Speaker Systems, the Inflatable Movie Screen Package is the ultimate party rental. The screen that we rent out is, in a word epic. 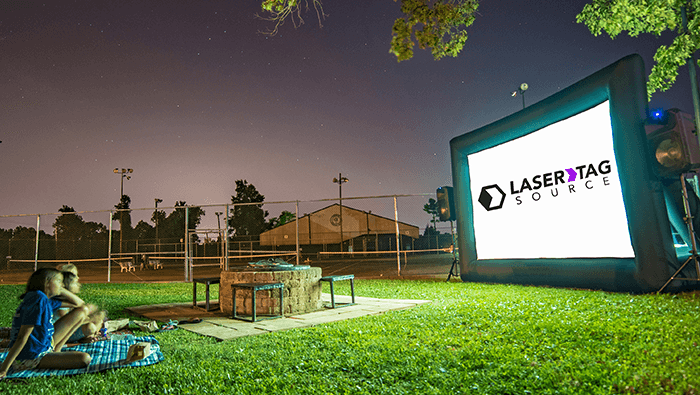 Backyard movie theaters have never been this easy! We send you the inflator, so all you have to do is plug it in and watch it go! The screen inflates in roughly five minutes. Taking it down at the end of the night is just as easy – just unplug the inflator, open the large velcro hole, and watch as the screen deflates. Then just fold it up and you’re ready to ship it back! Question: What is the definition of “Laser Tag Source Projector”? 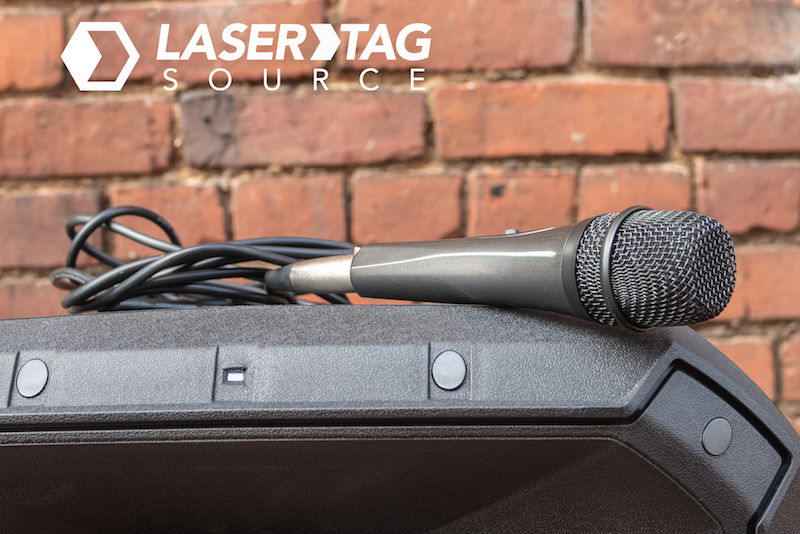 That’s right – at Laser Tag Source, we only rent out high-definition projectors. We also include a Blu-Ray player for you. Now, if you don’t want to use the provided Blu-Ray player, you can also connect your laptop (or even gaming system!) to the projector. So whether you are watching your favorite Hollywood classic, binge-watching YouTube cat videos, or having a giant video game tournament, our projector is ready to throw those up on the big screen! The projector we include in this package is a short-throw projector, meaning it only needs to be a few feet from the screen. The Portable Speaker Systems are what bring the noise to your event. Just set one speaker up on each side of the screen, connect them to your projector, and listen in amazement to that wonderful Lord of the Rings soundtrack. These PA systems have lights for the situations where you’re playing music videos, or you can turn off the lights if you just want everyone’s eyes to be fixed on the screen. Plus, with the included microphone in this package, I wouldn’t be surprised to start seeing more and more karaoke parties! Just like with our laser tag guns, the Inflatable Movie Screen is for rent! The whole process is as easy as inflating a 16-foot movie screen (remember: it’s super easy). 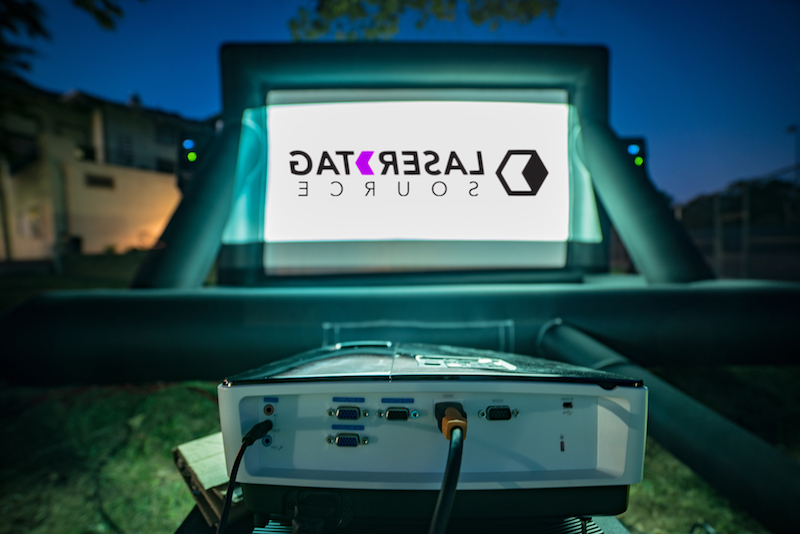 To get this backyard movie theater for your event, just head up to the top of our page and click the “Place Reservation” button. Once you’ve gone through the 2-click process of reserving this system, just make the payment and start getting excited! We will ship everything to you, you enjoy it for your event, and then you just pack it back up and ship it back to us! So what are you waiting for? !